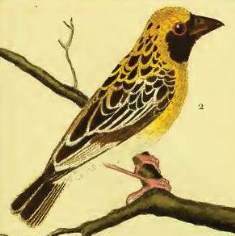 Linnaeus (1766) briefly described the Baya Weaver, based on the longer description in Brisson 1760. 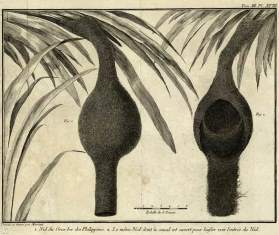 Mathurin Jacques Brisson, a French zoologist, gave the names "Le Gros-bec des Philippines" (French) and Coccothraustes philippensis (Latin). Brisson's painting is poor, and early ornithologists suggested it referred to another Asian weaver, but Arthur Hay (1881) confirmed that Brisson and thus Linnaeus referred to the Baya Weaver. Brisson noted that the Baya Weaver originated from the Philippines Isles but this locality is an error, and Hartert (1902) realised this and suggested the type locality should be Ceylon (Sri Lanka), without providing a reason for this choice. 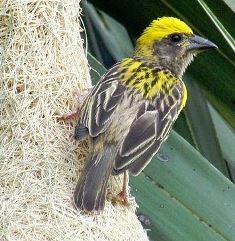 Stresemann (1952) showed that the Baya Weaver was collected by Pierre Poivre, the administrator of Mauritius and Reunion. 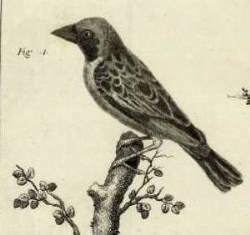 Poivre travelled to the Coromandel Coast, ie SE coast of India, in 1753 being based at Pondicherry (or Puducherry) where Poivre collected several species of birds, including the Baya Weaver. The Stresemann (1952) reference appears to have been overlooked as modern texts still refer to Sri Lanka as the type locality. Poivre sent the Baya Weaver to Abbe Octave Aubry, a French parish priest who was rector of Saint-Louis and who collected bird specimens. Brisson visited Aubry to describe the new birds in the collection. Poivre also collected at least 2 nests of the Baya Weaver, which Brisson described in his text. These nests are the earliest illustrations of weaver nests in Western literature. The first colour illustration of the Baya Weaver is in the book by Edme-Louis Daubenton, containing coloured engravings by Francois-Nicolas Martinet. Tha Baya Weaver is well known in India and there are references to this bird in Indian literature that pre-dates the Western scientific literature. philippensis Named (incorrectly) after the Philippine Islands, which were named for Felipe (Philip) II King of Spain (1527-1598). Baya is a Hindi word for a weaver bird. Philippine Grosbeak, Travancore Baya, Indian Baya, Eastern Baya. In 1753 when Poivre visited India. Poivre's type specimens did not survive (Stresemann 1952), but the painting of Brisson serves as a type. Identification. 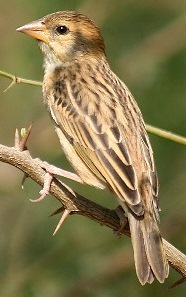 The Baya Weaver Ploceus philippinus is the most common and widespread weaver in Asia. The Baya Weaver breeding male has a bright yellow crown, dark brown mask, blackish bill, the upper parts are dark brown streaked with yellow, with a yellow breast and buff belly. Non-breeding males and females are dull coloured, resembling House Sparrows. Distribution. The Baya Weaver occurs in eastern Pakistan to Vietnam and western Indonesia (see map below, based on Handbook of the Birds of the World, Vol. 15). P. p. philippinus occurs on the Indus floodplain in Pakistan, most of India, southern Nepal and Sri Lanka (see yellow on map). 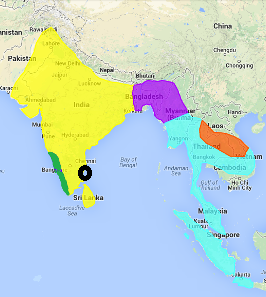 P. p. travancoreensis, occurs in SW India from Goa to Travancore (see green on map). The male is darker above and the breast is darker yellow than in the nominate. 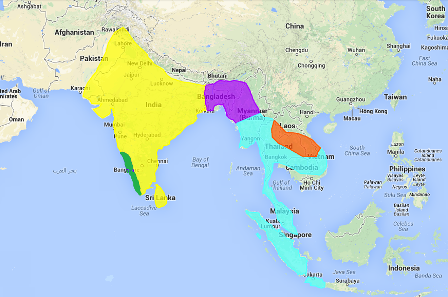 P. p. burmanicus occurs in India (West Bengal, Assam), Bhutan, Bangladesh and Myanmar (see purple on map). It is larger than the nominate, the male has a paler face and throat, and buff breast with darker mottling. P. p. angelorum occurs in Thailand and Laos (see brown on map). This subspecies has a buff breast and black streaking on the upperparts. P. p. infortunatus occurs in Myanmar to Vietnam, and south to Java and Bali (see light blue on map). This subspecies is more rufous on the upperparts, breast and flanks than in the other races. Habitat. The Baya Weaver inhabits grassland, scrub with scattered trees, mangroves and cultivated areas. It is generally found in open country near water. Food. The Baya Weaver feeds on seeds, including those of grass, rice, wheat, maize, sorghum, millet and sunflowers. Insects include grasshoppers, flies, termites, beetles, caterpillars and butterflies. It also feeds on nectar, spiders, small snails, and rice frogs. Rice is often the most important food item. The Baya Weaver occupies midday roosts near the feeding grounds. Breeding. The Baya Weaver is polygynous, with 3-5 females per male. It is usually colonial, with up to 60 nests in a single tree and more than 200 in some colonies, but solitary nests may be found. It sometimes breeds in mixed colonies with other weavers. The nest is retort-shaped, and usually with a long entrance tunnel. It is woven by the male from strips of palm, grass or rice-plant leaves. The male builds a ring and then completes the roof, so that the nest resembles a helmet with a chinstrap. Blobs of mud are added to the nest, most probably for reinforcement. The nest is only completed if a female accepts it. The entrance tunnel is built last, often 40-65 cm or more in length. The nest is placed 2-30 m above the ground or water. More than 35 plant species have been used, but Acacias are often favoured. Often colonies are close to human habitation, and are also found on telephone lines. Nests are sometimes associated with wasps or aggressive ants. The eggs, most commonly clutch of 3, are white. The female incubates and feeds the chicks, although some males help feed in later stages. Nest predators include snakes, crows, and probably monkeys. Nest destruction by humans is probably the most important source of loss. Old nests are used by a varity of birds and animals, including Scaly-breasted Munia Lonchura punctulata, Indian Silverbill Euodice malabarica, long-tailed tree mouse Vandeleuria oleracea, and nests abandoned at the helmet stage may be used as roost sites by painted bats Kerivoula picta.